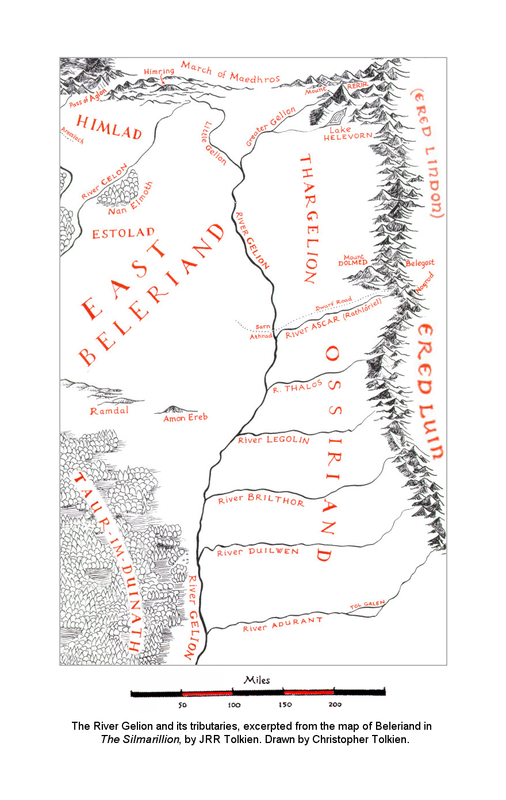 Location: The easternmost region of Beleriand, between the River Gelion on the west and the Blue Mountains on the east, bounded by the rivers Ascar on the north and Adurant on the south. 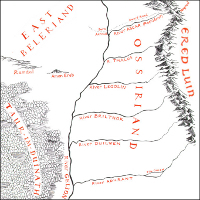 The Gelion River in East Beleriand, showing Ossiriand. [Between] Ascar in the north and Adurant in the south, and between Gelion and Ered Luin, lay the far green country of Ossiriand, the Land of Seven Rivers. [In] the days of the Long Peace, Finrod Felagund... passed on alone towards the mountains of Ered Lindon that he saw shining afar; and taking the Dwarf-road he crossed Gelion at the ford of Sarn Athrad, and turning south over the upper streams of Ascar, he came into the north of Ossiriand. In a valley among the foothills of the mountains, below the springs of Thalos, he saw lights in the evening, and far off he heard the sound of song.... Then Felagund... looked down into the camp, and there he beheld a strange people. Now these were a part of the... following of Bëor the Old..., a chieftain among Men. sîr 'river', from root sir- 'flow', in Ossiriand (the first element is from the stem of the numeral 'seven', Quenya otso, Sindarin odo), Sirion; also in Sirannon (the 'Gate-stream'...) and Sirith ('a flowing', as tirith 'watching' from tir).... With change of s to h in the middle of words it is present in Minhiriath 'between the rivers'...; in Nanduhirion 'vale of dim streams'..., and in Ethir Anduin, the outflow or delta of Anduin (from et-sir). 1 A league is approximately three of our miles.